Christmas Markets, Christmas Music, Lunar Eclipse, Poverty eclipsed……..
All the above – – – it’s coming – – – but first! There is an array of things to be accomplished today and not sure what to do first…. Should it be: Wash the new percale/cotton sheets and find someplace in this apartment to hang them dry, or forget that and get me and my hair washed and out the door so that I can take the train, and then take Bus 48 towards Poissoniere where there’s a OFFICE DEPOT, of all things , and that way I could COPY my pen drive that really needs to be copied……OR should I head over to the Marais and check to see if those beautiful red leather boots are still there? All of this before 5pm where I must get to my KNITTING class at the church…..Oh! Decisions, Decisons!! And SO many STORIES – good thing I have a non usable iPhone that can atleast record my notes because everyday, every SINGLE day, there is a story to be told out of the most simple things that meet the eye, the ear, or all of the senses combined……. 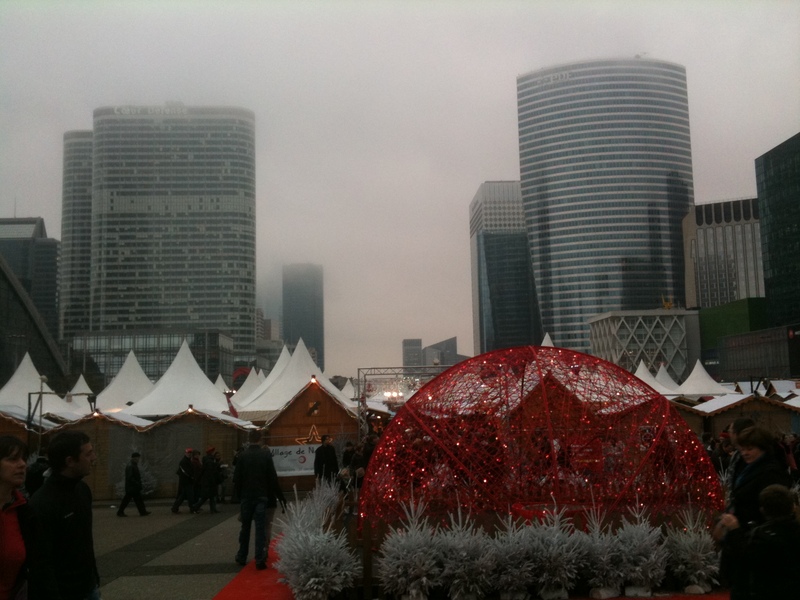 Instead of Swiss mountains, we've got La Defense in the background!! This is where I am – So above stories are on hold for a day…….. 1.) Where did you get your new cotton sheets?